Play builds your child's creativity and imagination as well as other skills. Whether it is simply rolling a ball back and forth with a sibling or putting on a costume and imagining she's an astronaut—she's developing important social skills such as learning to take turns, cooperation, and getting along with others. Does all play look the same to you? 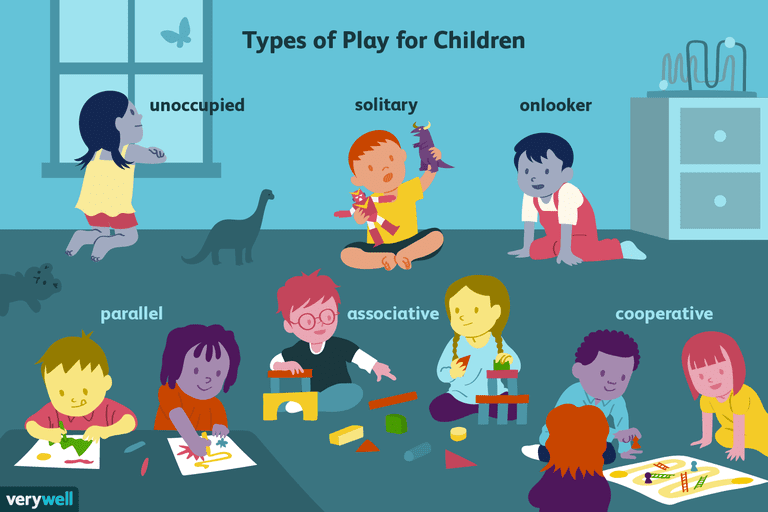 Sociologist Mildred Parten describes six types of play that a child will take part in, depending on their age, mood, and social setting. Unoccupied play refers to activity when a child actually isn't playing at all. He may be engaged in seemingly random movements, with no objective. Despite appearances, this definitely is play and sets the stage for future play exploration. Solitary play is just what it sounds like—when your child plays alone. This type of play is important because it teaches a child how to keep himself entertained, eventually setting the path to being self-sufficient. Any child can play independently, but this type of play is the most common in younger children around ages 2 or 3. At that age, they are still pretty self-centered and lack good communication skills. If a child is on the shy side and doesn't know his playmates well, he may prefer this type of play. Onlooker play is when a child simply observes other children playing and doesn't partake in the action. It's common for younger children who are working on their developing vocabulary. Don't worry if your little one is behaving this way. It could be that the child feels shy, needs to learn the rules, or maybe is the youngest and wants just to take a step back for a while. Put two 3-year-olds in a room together and this is what you are likely to see: the two children having fun, playing side by side in their own little world. It doesn't mean that they don't like one another, they are just engaging in parallel play. Despite having little social contact between playmates, children who parallel play actually learn quite a bit from one another like taking turns and other social niceties. Even though it appears they aren't paying attention to each other, they truly are and often mimic the other one's behavior. As such, this type of play is viewed as an important bridge to the later stages of play. Slightly different from parallel play, associative play also features children playing separately from one another. But in this mode of play, they are involved with what the others are doing—think children building a city with blocks. As they build their individual buildings, they are talking to one another and engaging each other. This is an important stage of play because it helps little ones develop a whole host of skills—socialization (what should we build now?) and problem solving (how can we make this city bigger? ), cooperation (if we work together we can make our city even better) and language development (learning what to say to get their messages across to one another). Through associative play is how children begin to make real friendships. Cooperative play is where all the stages come together and children truly start playing together. It is common in older preschoolers or in younger preschoolers who have older siblings or have been around a lot of children). Cooperative play uses all of the social skills your child has been working on and puts them into action. Whether they are building a puzzle together, playing a board game, or enjoying an outdoor group game, cooperative play sets the stage for future interactions as your child matures into an adult. Dramatic/Fantasy Play: When your child who loves to play dress up, doctor, or restaurant, it's dramatic or fantasy play. Through this type of play, not only does your child's imagination get a workout, but she learns how to take turns, cooperate, share and work on language development. Through roleplay, kids are also able to learn about functioning in the greater community. Competitive Play: Whether she's beating her brother at Chutes and Ladders or playing on a local soccer team, your child is engaging in competitive play. Rules and turn-taking, and functioning as part of a team are the big lessons taken from this type of play. You may have to give your child guidance about dealing with both winning and losing. Physical Play: Gross and fine motor skills really come into play here, whether your child is throwing a ball or riding a bike. Physical play encourages kids to be active. Constructive Play: Forms of constructive play include building with blocks, making a road for toy cars, or constructing a fort out of couch pillows. Constructive play teaches kids about manipulation, building, and fitting things together. Cognitive skills are used to figure out how to make something work best, whether it is a block tower that won't stand up or a sand castle that keeps collapsing. Symbolic Play: This type of play can be vocal (singing, jokes, rhymes), graphic arts (drawing, coloring), counting, or making music. This type of play helps children learn to develop skills in expressing themselves and exploring their experiences, ideas, and emotions. Types of Play. Child Development Institute. Whitebread D. The Importance of Play. April 2012.